Focal epithelial hyperplasia (FEH) or Heck’s disease is a rare viral infection of the oral mucosa caused by human papilloma virus especially subtypes 13 or 32. The frequency of this disease varies widely from one geographic region and ethnic groups to another. This paper reports an Iranian case of extensive focal epithelial hyperplasia. A 35-year-old man with FEH is described, in whom the lesions had persisted for more than 25 years. The lesion was diagnosed according to both clinical and histopathological features. Dental practitioner should be aware of these types of lesions and histopathological examination together and a careful clinical observation should be carried out for a definitive diagnosis. Multifocal epithelial hyperplasia (MEH) previously known as focal epithelial hyperplasia(FEH, Heck disease) is a relatively rare and uncommon asymptomatic disease of oral mucosa (1, 2). The first case report was published by Dr Heck and his team in 1965 (3). Worldwide FEH is rare; however, it is frequently observed among specific ethnic and racial groups. FEH is found in a high frequency among Inuits and Indians resident in North, Central and South America, Eskimos from Greenland and North Canada, and descendants of Khoi-San in South Africa (4). As the disorder is rare in other communities, there are few population studies, most of which being of geographical regions and/or ethnic groups in which FEH is common. The prevalence of FEH in the Eskimo population varies from 7% to 36% currently, it is known to exist in many populations and ethnic groups (5). However, the disease is relatively rare in the Asian countries (6). It is apparently produced by human papilloma virus (HPV) specially subtypes 13 and 32 (3). In spite of the fact that the most common associated subtypes are 13 and 32, cross-reaction with other subtypes has also been reported (1-5). Moreover, the subtype 32of HPV tends to cause the disease in the older age groups while the subtype 13 of HPV seems to be equally involved in the development of disease in both young and old patients (7). This condition often affects multiple members of given family. This familial tendency may be related to either genetic susceptibility or HPV transmission between family members (5). Factors that determine disease susceptibility are unclear, but genetics and having human lymphocytic antigen(HLA-DR4,DRB10404) allele in particular, are thought to play a major role in multifocal epithelial hyperplasia (2, 3). Multifocal epithelial hyperplasia is a rare disease and its epidemiology has not been studied with regard to geographic localization. The majority of published cases are from the indigenous population of the American continent and Eskimos from Greenland (3). The lips are most common frequent site of disease and none of the studies associated multifocal epithelial hyperplasia with precancerous lesions, in spite of its close association with HPV (3). A 35-year old Iranian man was referred to Department of Oral Medicine, Faculty of Dental Sciences, University of Shahid Beheshti, Tehran, Iran. His chief complaint was multiple oral mucosal lesions in his mouth (Fig.1). The patient was healthy person and his physical examination showed no significant abnormality. Intraoral examination revealed multiple, soft, sessile, smooth surface papules and nodules involving upper, and lower labial mucosa and right and left buccal mucosa. In other words, all of the oral mucosa had been involved by the disease (Fig.2, 3).These lesions were not ulcerated or inflamed and all of them were asymptomatic. Size of papules and nodules ranged from 2-10mm in diameter. Patient mentioned his oral lesions had been presented from his childhood. The largest lesions, which were located at lower and upper lip, were interfering with patient's speech and esthetic (Fig.4, 5). After obtaining written informed consent from the patient, in order to reporting his oral lesions and use of his photography’s, based on his present history and due to clinical diagnosis, we carried out a biopsy to confirm our diagnosis. The lesions on the buccal and upper labial mucosa were excised under local anesthesia without any complication and sent for histopathological examination. 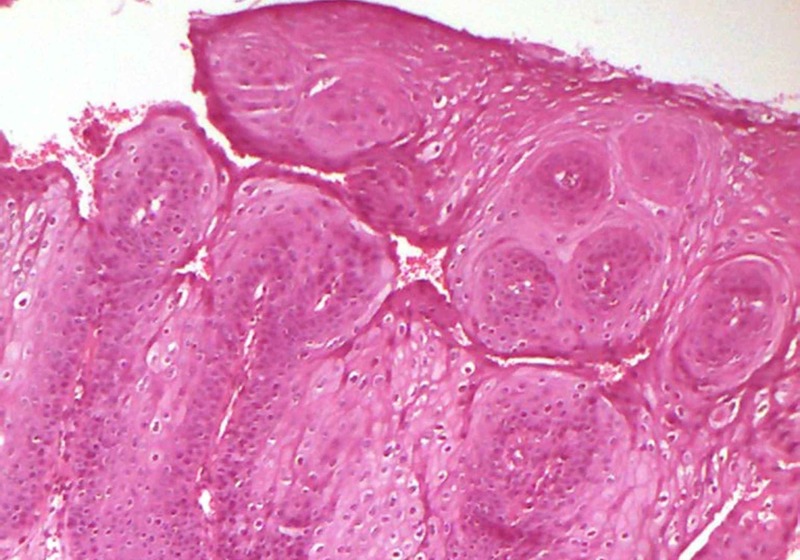 The histhopatological study revealed a squamous epithelium with focal parakeratosis, hyperkeratosis, acanthosis, veroucous proliferation and marked papillomatosis (Fig.6). Hyperplasia of basal cells, and isolated perinuclear cellularvacuolization (koilocytosis), cellular binucleation and nuclear irregularities were other features. The presence of epithelial dysplasia was not detected. There were well isolated mitosoid cells (Fig.7). Considering the diagnosis and the benign nature of the disease no treatment was attempted and this was explained to the patient. MEH or Heck’s disease is well-known by Latin-American dental and medical practitioners(8)but it is a rare entity in Asia(1)and there is no report of the prevalence of this disease in Iran. This disease appears in the first and second decades of life and is more common in children (9, 10). Our patient has had the disease since he had been 6 years old. Although it has been suggested that poverty is an associated factor to this disease (10, 11), our patient does not belong to low socioeconomic groups. In some studies there is a female predilection about MEH (10-13), and familial distribution has been reported in most previous studies (11, 13) but our patient did not report such findings in any of his family members. MEH is clinically characteristic by multiple circumscribed, sessile, elevated nodules of the oral mucosa, which their colors are like the adjoining oral mucosa (4). In areas with mechanical trauma, frictional keratosis will add to the previous lesion and make it seem whiter (13, 14). In our case the buccal and labial mucosa are involved and the color is matched with the intact mucosa, which is like most other studies (11-13). There is one study that suggests HPV 24 as an etiologic factor in long-standing MEH (15) and malignant transformation has been reported in that case, although accuracy of clinical diagnosis in that case remains doubtful. The long-term behavior of FEH lesions is unclear, in particular if recurrence is likely. FEH lesions may progress and increase in size, remain unchanged and persist for several years or may undergo spontaneous regression and resolution within months to years (4). In our case, the patient had had the lesions from childhood and had no change in their size and also no malignant changes was observed after the 25 years that our patient had the lesions. MEH is considered as a regressive lesion (9, 10, 12) but our patient did not report any decrease in the size or number of the lesions. Duration of the lesions was between few month to 30 years (9, 11, 12, 16) and our patient had the lesions for a long period of 25 years. Differential diagnosis consists of Condyloma acuminatum,Verruca volgaris, Papilloma, Irritation Fibroma,Verusiform xantoma, Juvenile papillomatosis and syndromes such as multiple endocrine neoplasia, Neurofibromatosis,Tuberous sclerosis, Cowden and Goltz-Gorlin.Verruca vulgaris and Papiloma are usually small proliferation of wart-like masses. Verruciform xanthoma is a single lesion, usually pink in color, and seems to occur in areas exposed to irritation or trauma. Multiple endocrine neoplasia syndrome type IIb is characterized by sessile lesions typically on the tongue (Neurofibromas), patient may have a marfanoid facial appearance, may have high risk of thyroid medullary carcinoma and pheochromocytoma (4). Neurofibromatosis may be associated with cutaneous pigmentation, epilepsy, and other neurological features. Tuberous sclerosis may be associated with subungual fibroma, cutaneous hypopigmentation, enamel defects, epilepsy or mental impairment. Cowden's syndrome is typically associated with multiple hamartomas, and patients have an increasing risk of developing cancers (especially of thyroid and breast). Goltz–Gorlin syndrome characterized by multiple nevoid basal cell carcinoma, skeletal abnormalities and keratocyst formation (4). All of these diagnoses could be ruled out by clinical examination and an exact history taking, but the most confusing ones are Condyloma acuminatum and Irritation fibroma. In Condyloma acuminatum, there are clustered papules with papillary surface in ventral tongue and floor of the mouth because of urogenital contact with an infected partner. MEH lesions tend to be flatter and more numerous and location of lesions is very characteristic. If discrete papules are present, Irritation fibroma should be considered in differential diagnosis. Pale appearance, increasing size and an obvious irritation can be helpful to distinguish Fibroma from MEH (5). In this case, the lesion on the lower lip mucosa was excised under local anesthesia to arrive at a definitive diagnosis. Several treatment modalities have been proposed for MEH, like cryotherapy, electrocoagulation, treatment with carbon dioxide laser or systemic treatment with interferon-α or topical treatment of interferon-β and retinoic acid (17). In recent years, several authors have reported good results with long durations of remissions with CO2 laser surgery, especially in patients with widespread, chronic, and resistant disease. In one study, many treatment modalities had been tried with inadequate results, but the CO2 laser surgery and recombinant α-2β-interferon combination therapy had resulted in complete remission, and no recurrence occurred within a follow-up period of 2 years (18). Treatment with carbon dioxide laser surgery was recommended to the patient due to the esthetic chief complaint of patient but he did not cooperate for it. Focal epithelial hyperplasia (FEH) or Heck’s disease is a rare viral infection of the oral mucosa. Herein, we reported an extensive involvement of the oral mucosa by FEH. Saghafi-Khadem S. Multifocal epithelial hyperplasia, a rare oral infection in Asia: Report of twelve cases in Iran. Med Oral Patol Oral Cir Bucal 2010;15(4):591-5. Bennett LK, Hinshaw M. Heck's disease: diagnosis and susceptibility.Pediatr Dermatol 2009;26(1):87-9. Bascones-Martinez A, Cok S, Bascones-Ilundáin C, Arias-Herrera S, Gomez-Font R, Bascones-Ilundain J. Multifocal epithelial hyperplasia: A potentially precancerous disease? (Review).Oncol Lett 2012;3(2):255-8. Said AK, Leao JC, Fedele S, Porter SR. Focal epithelial hyperplasia–an update. J Oral Pathol Med 2013;42(6):435-42. Nevile B, Damm D, Allen C, Bouquot J. Oral and Maxillofacial Pathology. Philadelphia: Saunders. Elsevier; 2009. Jayasooriya P, Abeyratne S, Ranasinghe A, Tilakaratne W. Focal epithelial hyperplasia (Heck's disease): report of two cases with PCR detection of human papillomavirus DNA. Oral Dis 2004;10(4):240-3. Ozden B, Gunduz K, Gunhan O, Ozden FO. A Case Report of Focal Epithelial Hyperplasia (Heck’s disease) with PCR Detection of Human Papillomavirus.J Oral Maxillofac Surg 2011;10(4):357-60. Ledesma-Montes C, Garces-Ortíz M, Edmundo B-l. Multifocal Epithelial Hyperplasia. An Unusual Lesion.webmedcentral.com.2012, 17 (5): WMC003003, ISSN 2046-1690. Borborema-Santos CM, Castro MM, Santos PJB, Talhari S, Astolfi-Filho S. Oral focal epithelial hyperplasia: report of five cases. Braz Dent J 2006; 17(1):79. Ledesma M, Torres V, Garces O, Lopez M. Hiperplasia epitelial focal (enfermedad de Heck). Estudio clínico-patologico. Practica Odontologica 1992; 13(7):21-6. Ledesma-Montes C, Garces-Ortíz M, Hernandez-Guerrero JC. Clinicopathological and Immunocytochemical Study of Multifocal Epithelial Hyperplasia. J Oral Maxillofac Surg 2007;65(11):2211-7. Ledesma-Montes C, Vega-Memije E, Garces-Ortíz M, Cardiel-Nieves M, Juarez-Luna C. Multifocal epithelial hyperplasia. Report of nine cases. Med Oral Patol Oral Cir Bucal 2005;10:394-401. Gonzalez LV, Gaviria AM, Sanclemente G, Rady P, Tyring SK, Carlos R, et al. Clinical, histopathological and virological findings in patients with focal epithelial hyperplasia from Colombia. Int J Dermatol 2005;44(4):274-9. Binder B, Wieland U, Smolle J. Focal epithelial hyperplasia (Heck disease) in a black child. Pediat dermatol 2007;24(4):E31-E2. Jablonska S. Demonstration of HPV 24 in long-standing Heck’s disease with malignant transformation. Eur J Dermatol 2000;10(3):235-6. Flaitz CM. Focal epithelial hyperplasia: a multifocal oral human papillomavirus infection. Pediatr Dentistry 2000;22(2):153-4. Moerman M, Danielides VG, Nousia C, Van Wanzeele F, Forsyth R, Vermeersch H. Recurrent focal epithelial hyperplasia due to HPV13 in an HIV-positive patient. Dermatology 2001;203(4):339-41. Akyol A, Anadolu R, Anadolu Y, Ekmekci P, Gurgey E, Akay N. Multifocal papillomavirus epithelial hyperplasia: successful treatment with CO2 laser therapy combined with interferon alpha-2b.Int J Dermatol 2003;42(9):733-5.